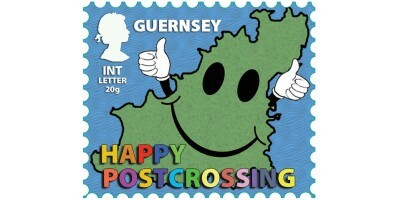 The Guernsey issue stamp, depicts an outline of Guernsey with a smiley face, giving the ‘thumbs up’ to the hobby of Postcrossing. 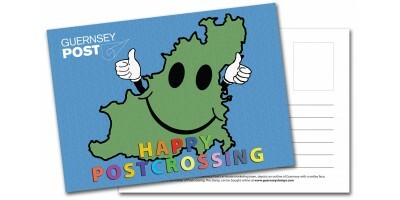 Postcrossing is the union of the words "postcard" and "crossing"..
Guernsey Post is delighted to announce that it will issue its first Postcrossing stamp in celebration of a hobby enjoyed by over 470,000 people worldwide (issue date 28 May). Following royal approval, The Bailiwick is the first in the Channel Islands – and one of only a handful of European postal administrations to produce a Postcrossing stamp. 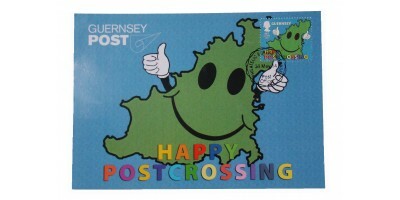 The Guernsey issue stamp, designed by Guernsey Post’s in-house marketing team, depicts an outline of Guernsey with a smiley face, giving the ‘thumbs up’ to the hobby of Postcrossing. Paulo loved to receive postcards from friends and family across the globe and wanted to receive even more postcards from other countries too. He came up with the idea of connecting people worldwide through postcards. After just a few days people were already signing up to the website to take part. 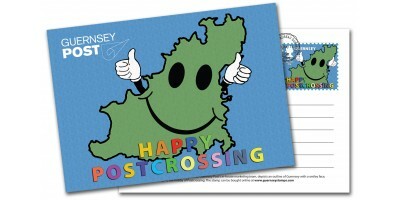 The hobby has had tremendous success and now, several years on 23 million postcards have been exchanged via Postcrossing. It is easy to join in and you can be receiving postcards from around the world in just a few days. Register on the website (for free!) and request an address. Mail a postcard to the address and wait to receive one back. Then register the postcard that you have received, on the website and request another address. Keep going for as long as you want to! It is that simple.